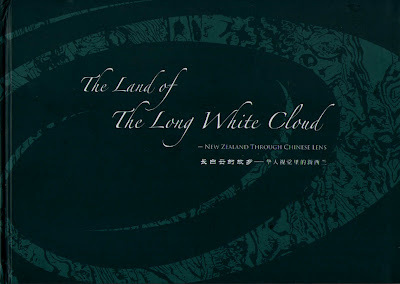 The Land of The Long White Cloud - New Zealand through Chinese Lens. Editors: Kenneth Wang, Hong Lin Xu, Leo Guan, Xue Wei He, and Heidi Xue. United Chinese Photography Association of New Zealand Inc., Auckland, 2012. A4 landscape format, hardbound 80pp, 78 photographs, no contact address nor recommended price. On the one hand this self-published book, organised by leaders in the United Chinese Photography Association of New Zealand, is hardly distinguishable from the commercial "Beautiful New Zealand" books that dominate airport bookshops and supplement the suntans and happy memories of most visitors. As such, it is at the higher level in regard to photographic skills. On the other hand, however, it does not question New Zealand propaganda of the 100% pure green kind that hides deep seated problems with dealing with urban and rural pollution, and non-sustainable practices, let alone social inequalities. Rather, it extols the virtues of the known - that an unpolluted "natural" environment, from the coastline to the tip of a mountain, is sublime subject matter that can open the heart and mind to feast on. Such exulting and breathtaking vistas, we know, can bring out the best of even a land agent when they discover that not every piece of real estate should be bought or sold at any cost without an environmental audit. Compared to the devastating turmoil of China's recent history, and what some of New Zealand's Chinese photographers went through to get to New Zealand in the first place, their idealism might be justified. Their rosy view of New Zealand as a paradise, however, is still a long way from the reality of the country of my birth, that I see. Just as it is for my friend Ans Westra, whose latest book, Nga Tau ki Muri - Our Future (Suite, Wellington, 2013) is a wake-up call for taking stock of what is actually being done to our land. But it is all relative, of course. Even the worst poverty in New Zealand is of soft kind compared to what is commonplace in many countries throughout the world, and seems acceptable by the powers that be as long as people don't actually starve to death in large numbers. Pollution also is relative and circumstantial. What would China's pollution be like now if civil and uncivil wars had not removed Henry Ford's advertising hoardings from China's vast markets during its turbulent and austere decades of the 20th Century? Come what may, it is the turn of China's middle class and nouveau riche to have their affair with the motor car. Hopefully, they can learn from the mistakes of New Zealand's old friends, the United States and other major plunderers and polluters of the natural landscape, and also the successes, like those of New Zealand's leading conservation photographers, Ian Macdonald and Craig Potton, who helped save endangered native forests and vital ecosystems. I don't know how national the membership of the United Chinese Photography Association of NZ is, but I have met members in Auckland and seen some of their work. Some also belong to Photowhisper Inc, a group of Chinese photographers, led by King Tong (KT) Ho, who teaches design and photography at the Auckland University of Technology. Ho hails from Hong Kong and has directed several exemplary exhibitions of NZ Chinese photographers work for the Auckland Festival of Photography over recent several years. He does not adhere to the "NZ is beautiful school" which many of New Zealand's photographers associated with its camera clubs still do, and has a more intellectual approach to photography, as one would expect of an academic. 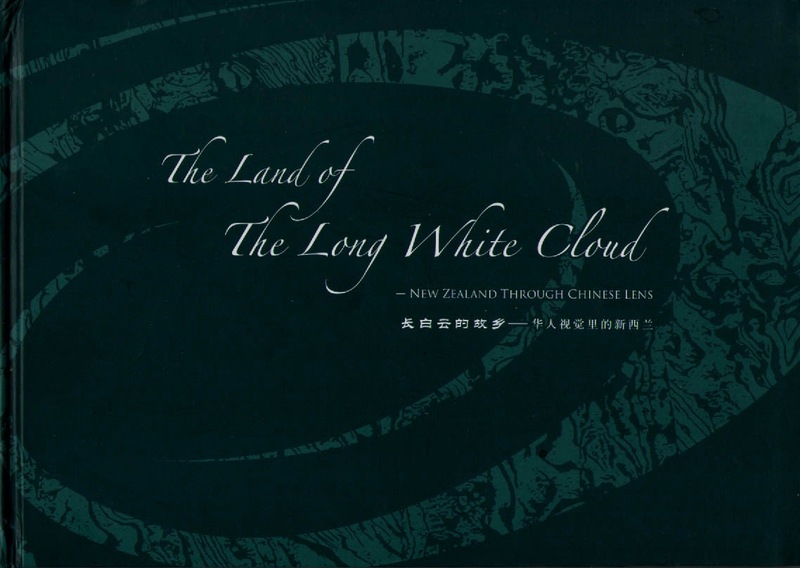 An exhibition of The Land of the Long White Cloud - New Zealand through Chinese Lens (sic.) was recently shown in Parliament Buildings, and opened by Prime Minister John Key, who is also Minister of Tourism. Thus, the flattering introductions of this eulogy appear to have been motivated by the desire for formal recognition of the United Chinese Photographer's group. I hope it worked because it is time that New Zealanders realised that they have a bevy of Chinese photographers, amateurs and professionals, with consummate skills. Showing one's work in Parliament Buildings is one thing, but whether it was seen by anybody willing to write a critical review is another issue. Certainly the book itself is its own worst enemy in regard to finding it or buying a copy: it contains no address or contact details, one of the signs of amateurism and haste, and the designer, at least, should have known better. That said, in alphabetical order, the people included in The Land of The Long White Cloud.... are as follows. They have partially anglicised their names by putting their family names last instead of first. I have indicated the number of their pictures in brackets. Bin Bai (5), Shun Mei Deng (6), Yu Feng (1), Bao Xiang Gao (1),Xiang Ming Gu (4), Leo Guan (6), Xue Wei He (5), Zhi Min Hou (3), Jackie Huang (5), Ben Zhou Li (3), Phoebe Li (2), Tian You Li (4), Feng Liu (4), Wei Liu (2), San Shan Lu (1), Zhong Zhi Man (2), Unidentified (final picture), Kenneth Wang (3), Chun Yi Xuan (1), Hong Lin Xue (6), Carl Yang (4), Qi Xian Yang (4), Heidi Ping Yu (4), Zheng Yuan Zhang (1). In this collection there are exemplary panoramic images by Hong Lin Xu in particular, whose Morning mist over Auckland is a special gem, and there are also classy views by Leo Guan, Carl Yang, and Zhong Zhi Man - collector's items each - for the delight they express. Qi Xian Liang's picture of kite surfers on Murawai Beach is superb, as are Bao Xiang Gao's 'Starry Night' and Zheng Yuang Zhang's 'Rainbows over falling water'. So two are Bin Bai's facing images of fireworks over Auckland, and Rangitoto Island at dusk which have the feel of glossy calendar pictures. Chun Yi Xuan's 'Shimmering Ripples' is more delicate, as is Phoebe Li's view of Lake Hawera. When it comes to photographing people, all of the pictures were made from a distance with a telephoto lens, and are nowhere as engaging as the landscapes. San Shan Lu was simply not close enough to get the best pictures from a surfing competition. The sports photographs - predominantly of yachting in Auckland - are more successful, including works by Wei Liu, Heidi Ping Xu and Shun Mei Deng. Despite its dubious concept, and the flaws in its design and production this book provides a valuable introduction to the work of some Chinese New Zealand photographers who deserve to be better known. As such, it reflects, like the work of the Photowhisper group, a degree of desirable assimilation that could lead eventually, to some of these photographers taking their place alongside, for example, the likes of Craig Potton and Andris Apse, as recognised masters of the landscape tradition in New Zealand. Having one's work exhibited and published for public and critical scrutiny is a vital step in the process of communication and recognition, for which the United Chinese Photography Association of New Zealand deserves credit. I hope they will take the next step with a more critical selection of work and more professional presentation. PS. Land of the Long White Cloud: New Zealand Through a Chinese Lens is available direct from photoakl_888@aliyun.com for $30 plus postage.